With its fast track to the heart of London, Slough is just as well connected to the capital as many of the city’s boroughs. Slough provides fast and frequent mainline trains (up to six an hour) that will get you directly into London Paddington station in just 17 minutes. From 2019 the arrival of the Elizabeth Line will connect Slough to the London Underground network with services directly into the West End and City. The transforming effect of the Elizabeth Line is shifting the centre of Slough towards the station. The Porter Building, along with an additional 500,000 sq ft of new office and residential developments, is being delivered with a wealth of built-in amenities. What’s more, it is creating new and vibrant public spaces. The central walkway allows for natural flow between the train station and The Curve (Slough’s newest architectural landmark), as well as the Observatory Shopping Centre. The Porter Building will host two food retailers on the ground floor, with tables and chairs spilling out onto the pavement opposite the station. 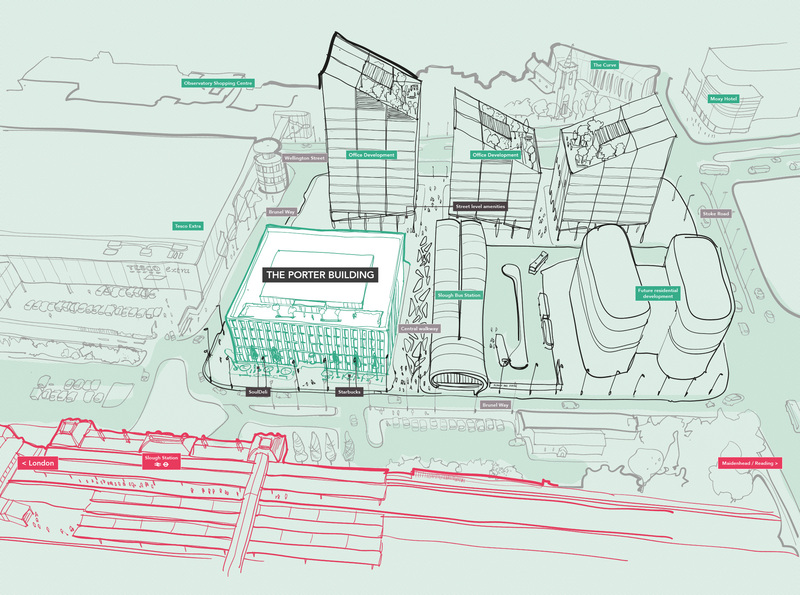 The development will deliver two office buildings, each offering food and beverage retailers on the ground level, as well as landscaping of the public realm pathway between the station and The Curve. Newly developed, the station provides yet another lively transport hub for the town. The Curve is a new performance venue, library and café that provides the centre piece to the ‘Heart of Slough’, a £400m redevelopment plan for the town centre.